Find an Amy Winehouse Tribute Act for hire near you in minutes! Option 1. Enter your event location below & contact an Amy Winehouse Tribute Act directly! Option 2. Request multiple quotes from available Amy Winehouse Tribute Acts Get Quotes! Option 3. Read information & advice on hiring Amy Winehouse Tribute Acts Read Advice! WANT TO KNOW MORE ABOUT Amy Winehouse TRIBUTE ACTs? Read on for the most comprehensive guide to booking an Amy Winehouse Tribute Act, including how much an Amy Winehouse Tribute Act costs, exactly what they will do at your event, plus tips, advice and information to help make your event one to remember! What exactly will an Amy Winehouse TRIBUTE ACT do at your event? Amy Winehouse was one of the most successful and highly respected singers of the 21st century. With her unique jazzy voice, the hugely talented Winehouse gave the world classic songs such as ‘Back to Black’, ‘Rehab’, ‘Valerie’, ‘You Know I’m No Good’, ’Tears Dry On Their Own’, ‘Love is a Losing Game’, ‘Amy Amy Amy’, and many more! The Amy Winehouse Tribute Act will consider material from all of the Amy Winehouse albums such as ‘Frank’, ‘Lioness: Hidden Treasures’, and the globe-smashing ‘Back to Black!’. ‘Body and Soul’, Amy’s 2011 duet with Tony Bennett, also gained Amy an older audience and so you can expect the Amy Winehouse impersonator to appeal to a wide-range of age groups! The Amy Winehouse Tribute Singer will impersonate Amy’s distinctive image as well by incorporating the trademark beehive hair, the tattoos (even if they are stick-ons!) and the polo shirts and 1960’s dresses! All this incorporated with the talented hired singer mimicking Amy’s voice and you’ll have the next best thing to the real Amy at your event! Mainly, an Amy Winehouse Tribute Act will entertain your audience with a fantastic live show that will put the wow factor into celebrations and impress your guests, whatever their entertainment tastes may be. What event types are Amy Winehouse Tribute ACTs hired for? Hire an Amy Winehouse Tribute for your wedding ceremony and you’ll have a professional singer who will give realistic renditions of Amy Winehouse’s classic songs. You can book the Amy Winehouse singer to perform live as the wedding guests are entering the wedding ceremony venue. For this precious moment, we would advise to request that the singer sings songs to get everybody in the mood, such as ‘Our Day Will Come’, which gives a lovely reggae tinged message! As the bride is walking down the aisle, we would advise to hire an Amy Winehouse impersonator to sing something such as Amy’s cover of ‘Cupid!’. The Amy Winehouse Tribute Act would be an ideal form of musical entertainment to hire for the wedding drinks reception due to the brilliant atmosphere her music brings with it! You can set up the Amy Winehouse Tribute Act to sing at the wedding drinks reception (whether it’s outside or inside) and you can expect the talented singer to perform as part of a full covers band or as a solo Amy Winehouse Tribute Act. For the wedding drinks reception, we would advise to play songs such as ’Stronger Than Me’, ‘Rehab’, and ‘Tears Dry on their Own’ as the wedding guests enjoy refreshments and schmooze! The wedding breakfast is the time of the wedding day when family and friends sit with the bride and groom and enjoy the wedding courses and champagne! What better way is there to soundtrack this ideal moment than by hiring an Amy Winehouse Tribute Act to bring that unique take on Ska, Motown, Reggae and Jazz?! The Amy Winehouse impersonator will run through the greatest hits of Amy Winehouse which will include ‘Rehab’, ’Take the Box’, and ‘In My Bed’. The Amy Winehouse Tribute can keep playing until the wedding speeches and the cutting of the wedding cake. The band can then strike up again as the wedding guests are leaving. Search our directory for the best Amy Winehouse Tribute impersonators local to your area and you will find a whole host of talented singers ready to take on the superstar’s dazzling vocals! The Amy Winehouse Tribute Singer would be a touching and fun form of live music to hire for your wedding evening drinks reception and will be ideal for any Amy Winehouse obsessive! Amy’s love of Ska, Reggae and Jazz means that she has left a legacy of classic party anthems and a string of brilliantly arranged covers. Hire an Amy Winehouse Tribute Act for your wedding evening drinks reception and you an expect to hear her take on covers such as ‘Cupid’, ‘Monkey Man’, ‘I heard it through the Grapevine’, and of course, we all remember Amy’s take on the song ‘Valerie!’. For the newlyweds first dance, you may want to hear songs such as ‘Will You Still Love me Tomorrow’, which Amy covered beautifully, and the stunning take on the Billie Holiday classic ’There is no Greater Love’. Amy’s talent was so natural that it’s almost impossible to hear her voice and not fall in love with it! 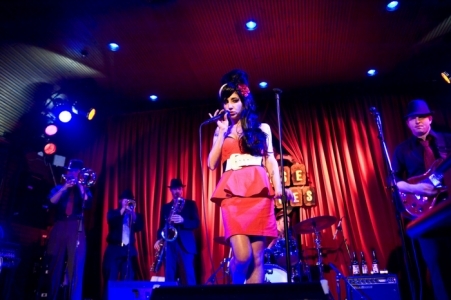 Hence, why an Amy Winehouse Tribute impersonator will be a great choice for your corporate event! The Amy Winehouse singer will mimic Amy’s famous sound and, mixed with Amy’s striking image, will be a surefire way to intrigue potential clients at your trade show or product launch! The Amy Winehouse Singer will go down a storm at your work-party such as a work Summer party, a Christmas party or a colleague’s leaving party where they will spellbind your workforce with Amy Winehouse masterpieces that will no doubt have colleagues singing along arm in arm! An Amy Winehouse Covers Band will be fantastic as cruise ship entertainment or as entertainment at a holiday resort! Because of Amy’s jazzy roots and her knack for covers of 1950’s and 1960’s songs, the Amy Winehouse Act will appeal to holidaymakers of all ages! If you’re are looking for the perfect musical act for your ‘Best of British’ party then book an Amy Winehouse Tribute Singer to impress your party guests! As you wave around the Union Jack, sip Pimm’s and munch on cucumber sandwiches, the Amy Winehouse impersonator will cover the greatest Amy Winehouse songs of all time! This will include the party classics ‘Valerie’, ‘Rehab’ and ‘Tears Dry on their Own!’. Any Amy Winehouse Tribute Act would be great for birthday party entertainment and due to the fact her music covers Jazz standards, Ska classics and her own unique music, the Amy Winehouse Act will appeal to the birthday’s of any age group! Whether it’s an 18th, a 21st, a 30th or a 50th, the Winehouse Tribute Act will go down extremely well! Book an Amy Winehouse lookalike for your cocktail party and you won’t be disappointed! The hired Amy Winehouse Act will run through dazzling versions of Jazz songs and Soul songs whilst a pianist is tinkering away in the background. The perfect type of music to relax your cocktail party guests! How much do Amy Winehouse tribute ACTS cost to hire? Our simple to use entertainment directory allows you to firstly search for the best Amy Winehouse Tribute Acts who are local (or travel to your area) and then via the contact form you may message them directly to enquire for a no obligation quote to perform at your event. Some acts will also add a rough price guide to their profile for your convenience. What are the usual set formats and performance lengthS for Amy Winehouse tribute acts? An Amy Winehouse Tribute Act can tailor their performance times to suit you and your event, however, on average, a professional Amy Winehouse Tribute Act will perform for two 45 minutes sets. How much space will an Amy Winehouse tribute act need at your event? If your Amy Winehouse Tribute Act comes as part of a full band, then you will need space for a full band back-line. This will mean that you’ll need a stage area of at least 4 metres by 3 metres. What equipment and set up requirements do Amy Winehouse tribute acts need? As with most artists who sign up to Entertainersworldwide.com, an Amy Winehouse Tribute Act will provide all of their own equipment. You may want to enquire if they need a PA to amplify their sound, in which case we would advise to use our easy to use messaging service to find out. We do ask that each performer gets a backstage area in which they can prepare for the performance ahead. If your venue does not have a backstage area, then we kindly ask that you enquire with the venue to seek an alternative space in which the performer can comfortably get ready to entertain. How can you find and book an Amy Winehouse tribute Act with Entertainersworldwide.com? WANT TO RECEIVE A RANGE OF QUOTES FROM Amy Winehouse Tribute Acts?